Founded by Greeks in the eighth century BC, Naples can lay claim to being one of the oldest cities in Italy, and its history set it somewhat apart from counterparts farther north. Southern Italy had been governed over the centuries by Byzantine, Lombard, Islamic, Norman, and Hohenstaufen rule. Prosperous and often well administered, the city was a gateway through which Greek and Arab learning entered western Europe. 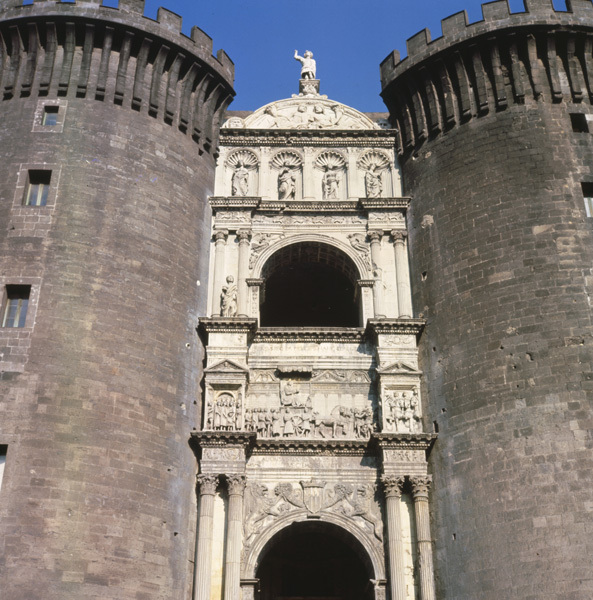 In 1266, the pope conferred the territory on Charles of Anjou, brother of the French king, who transferred his capital from Palermo in Sicily to Naples. After harsh rule provoked revolt, Sicily was taken over by the Spanish house of Aragon . Struggle between the Angevins and Aragonese went on for more than a century. Finally, in 1442, Naples fell to Alfonso of Aragon, who assumed the title “King of the Two Sicilies” (Sicily and Naples). On January 26, 1443, he made his triumphal entry into Naples. Alfonso had dominion over Aragon, Catalonia, Valencia, Sicily, Sardinia, and all of southern Italy—only the king of France could boast more territory. Although Alfonso’s court enjoyed great prestige, the king had still to legitimize his rule in Italy (initially only the Este family in Ferrara recognized him; Florence and Venice did so in 1450) and win favor for an unpopular Spanish court in Naples. Patronage was among his tools. Alfonso’s taste in painting ran to the art of northern Europe. (His preference for precise and minutely detailed works, created by using oil paints, helped introduce this new medium in Italy.) In architecture, however, Alfonso embraced a different style, cultivating Italian favor and satisfying his own interest in ancient history, with forms that derived from Rome. Between two towers of the imposing Castel Nuovo in Naples, which served the king as both fortress and palace, he inserted a tall marble entranceway whose registers recall Roman triumphal arches. On it, Alfonso had himself depicted in Roman guise in a classicizing relief that evoked his own entry into Naples. Other elements of the relief point to the old chivalric ideals associated with the Knights of the Round Table and allude to Naples’s possession of one of Christendom’s greatest relics, the Holy Grail. 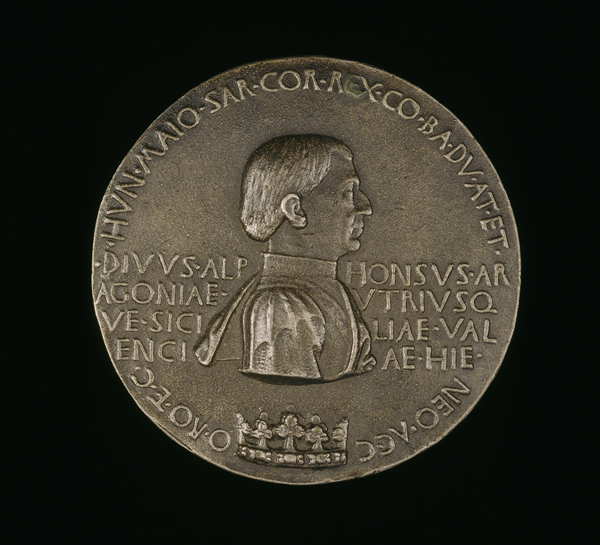 The inscription on the front identifies Alfonso as king of the Two Sicilies (note the crown below) and lord of a long list of other dominions. The reverse alludes to his triumphal entry into Naples in 1443. Contemporary witnesses described Alfonso’s chariot as pulled by four horses and guided by noblemen. (The medal shows its occupant as a winged figure of victory.) Alfonso’s procession was the first revival of the Roman triumph mounted in the Renaissance. This type of princely spectacle would be repeated many times afterward, honoring popes, emperors, kings, important brides and grooms, and a few lesser dignitaries. The responsibility for designing banners, carts, costumes, and archways usually fell to the court artist.